Sterdrive duo prop VOLVO DP290 with Bennett hydraulic trim. From the cockpit, access to saloon/galley. Saloon table reversible (small or large model), seating transforms into a double berth (140x190). Aft cabin double berth (140x190). Double berth cabin in the forepeak. heads with heads, shower and basin. 1.85 headroom everywhere on the boat with the exception of the aft cabin below the cockpit. FAIRLINE TARGA 33 for sale in France. 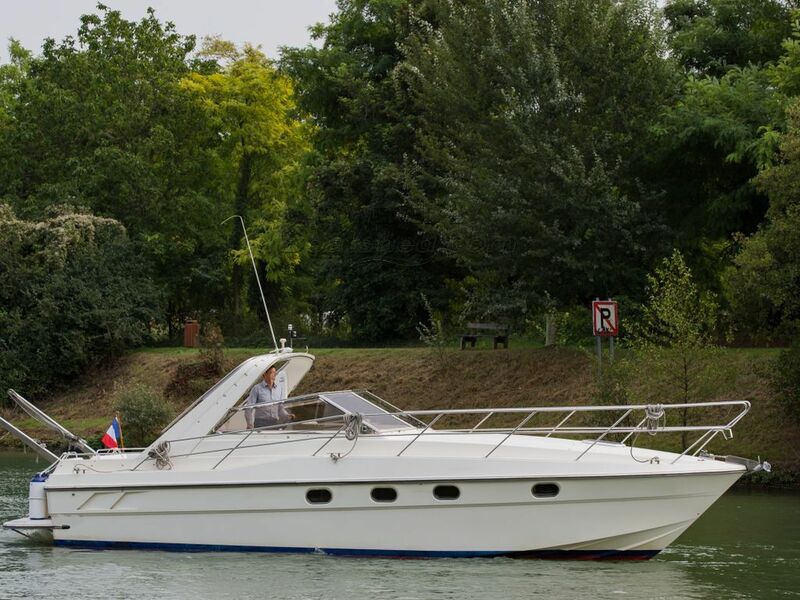 Boatshed Paris is happy to offer this FAIRLINE sports cruiser, model 33 from 1989, located in east of Paris. Maintained regularly by a fastidious owner, all cockpit covers have been renovated and new sun awning made on measure. Interior has been renovated (with the exception of the seating). Spacious interior with two separate cabins, ideal for a family or friends visiting, in less than 10.30 m, a large open cockpit to enjoy cruising or sunbathing. Mooring in the east of Paris could be transferrable under request at the Capitainrie. For more information or organise a visit, please contact, Pascal, your local broker at Boatshed Paris. This Fairline Targa 33 Double Cabins has been personally photographed and viewed by Pascal Gaetan of Boatshed Paris. Click here for contact details.